Hall of the Mountain King: Review: Masterplan, "Time to Be King"
Jorn Lande makes his return to Masterplan on their latest effort, Time to Be King, and it makes all the difference. The band’s 2007 outing, MKII, without Lande at the helm, was an OK effort, but he was definitely missed. This record makes the absence obvious. With Lande on the mic, they’re a much more powerful outfit. The record gets off to an upbeat, energetic power metal start on “Fiddle of Time.” Things slow down a bit with “Blow Your Winds,” a mid-paced number with a memorable guitar melody from band founder and ex-Helloween axeman Roland Grapow. Axel Mackenrott also provides some nice atmospheric keys on the number. It’s a very traditional-metal flavored tune and one of my favorites from this record. The title track keeps things going in the right direction, opening with some Gregorian chanting and a majestic guitar piece before accelerating to a slightly faster power metal gallop with some nice tempo shifts and a powerful dramatic chorus. “Lonely Winds of War” opens with some medieval balladry, and if you’ve read my reviews before you’ll know I’m a sucker for medieval balladry. From there it moves to a midtempo number that puts Lande’s voice out front, but also features some of the grittiest guitar work from Grapow. “The Black One” gives bassist Jan S. Eckert his chance to star on the record, and is a solid piece in an otherwise lackluster late part of the record. Perhaps the centerpiece of Time to Be King is “The Dark Road,” which brings together the best that the band has to offer in one tune. It opens with an uptempo power metal piece, but then drops the pace and lets Lande work that bluesy tone in his voice that he does so well. The song blends soaring parts with soulful pieces and very dramatic bits. It’s not my favorite track, but it’s one of the more impressive. As with any power/melodic metal recording, you’ll find some stock pieces here and there, but Masterplan always seems to have the ability to elevate even a typical power metal number like “Far From the End of the World,” even if it’s only by the sheer power of Lande’s voice. Not every song on Time to Be King is a winner, and toward the end of the record things get a little less impressive. Lande has his only miss on “The Sun is in Your Hands,” which fails despite a solid traditional metal riff from Grapow. Songs like “Blue Europa” and “Under the Moon” just don’t have a whole lot to recommend them at all. That said, Lande’s voice – as if I need to say it again – is outstanding, and the musicianship is great in all phases. 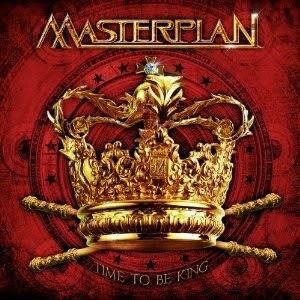 If you enjoy melodic metal, it’s tough to beat Masterplan. Get "Time to Be King."